Another week, another Blinkbox promotion as Tesco works hard to drive sales as its fledgling digital downloads business. 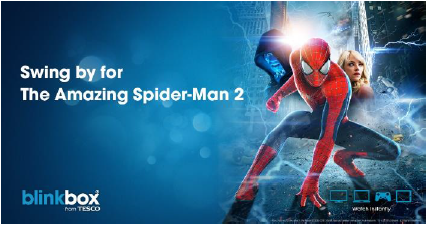 The new promotion is linked to Spiderman 2. You will receive 500 Clubcard points when you buy Spiderman 2 from Blinkbox by September 13th. The cost is £9.99. Be sure that you choose to buy the film rather than rent it. This is an OK deal if you are sure that you will get more than 2x the face value of your Clubcard vouchers. And, of course, you get to see Spiderman 2 as well! The Blinkbox offer is here.